What future for St Margaret’s? In a few days time, the Reverend David Bickersteth will be celebrating his last Christmas at St Margaret’s C-of-E Church here in Draycott. He is leaving full-time ministry at Easter 2015, after nearly nine years at St Margaret’s (nearly forty in all as a clergyman…). He and his wife will retire to the north of England. The question is: once David has gone, will St Margaret’s itself survive for many more Christmases? It is a real question. In four years’ time, in 2018, St Margaret’s will celebrate 750 years of being a working church at the centre of our community…; and it seems unthinkable that it could be into its final years. St Margaret’s is, like other semi-rural churches, finding it hard to pay for itself. It costs around £30,000 a year simply to keep the church alive – and that is only in terms of basic running costs, and doesn’t take into account long-term projects and large repairs. In 2013, the church broke even, but in past years, it has had to dip into its reserve-funds to make up the shortfall. Happily, due to two very successful Draycott Fayres – the church’s main fund-raising source after parishioner donations – they have not had to raid the diminishing reserves this year. But the future remains on a knife edge. St Margaret’s only has a regular congregation of around twenty people. In other words, each worshipper needs to raise £1,500 a year to keep the church going. With amazing generosity of time and money, these parishioners make the attempt. However, the fact is that the funds go the other way. Every parish supports the diocese it is a part of, not the other way round. St Margaret’s needs to raise around £13,000 a year just to pay out its diocese ‘share’. Unless it pays its share, it will not be assigned a minister, nor be supported by the wider CofE organisation. Replacing departing vicars/rectors has become harder and harder for the Church Of England; the average wait-time in Lichfield Diocese is eight months, though one can always hope David will be replaced quicker than that. When a church is without a minister, it can often go into decline. Matters at St Margaret’s are not helped by the fact that the present assistant minister, the Reverend John Pretty, has said he will also have to be leaving the parish soon, because of family concerns. It is obvious what such issues could mean. Churches without clergy long-term are reduced to opening as little as once a month, or can even be shut altogether, or even sold off. (Even a major town church, such as Gnosall’s, was facing closure recently because of this). In Lincolnshire, it is a fact that one priest alone now ‘looks after’ a staggering twenty-four churches, most of which are closed to all intents and purposes. And if the congregation fails to raise the necessary £30,000? The likely event of a ‘default’ is that our parish is merged into another. This quite common: in the past few years, Meir has had to merge into Longton; and Tean has had to merge into the Uttoxeter ‘team’. If St Margaret’s had to merge, it would officially lose its independence, and that would be the end of the ancient ecclesiastical parish of Draycott-le-Moors. And what might halt this apparently unstoppable slide? The actual amount of money to keep the parish going over the next ten years is not actually that much (compared to a Premier League player’s weekly salary!) and sometimes an amazing windfall might come a parish’s way. Nearby Dilhorne Church had their prayers answered when a large property was willed to it… which kept the wolf from the door there. So… maybe you’re one of the many people living abroad (or in other parts of the UK) who read this blog and remember what good times you had in Draycott, and how you valued the work of the parish when you lived here. If so, maybe you want to contact the treasurer of St Margaret’s PCC, about how you could contribute. The other question is over the ancient building itself. Should the village (including the part of it who are not worshippers at the church) support a separate fund for maintenance of the historic building, simply because it is part of the village’s local heritage? It’s a thought; though no one has yet come up with an idea on how this might be brought about. # The church’s affairs are run by the ‘Draycott Parochial Church Council’, a group of elected parishioners. It is the body responsible for financing the parish’s work and maintaining the church building. # In 1984 St Margaret’s joined St Peter’s at Forsbook to become a ‘united benefice’, although each church is still actually the centre of an independent parish. So, St Margaret’s and St Peters’ share a priest – who is, until early next year, the Rev David Bickersteth. # At the moment the rector is assisted by a ministry team of licensed lay ‘Readers’ (licensed to take services, but not baptise or celebrate Holy Communion or take marriages) and one ‘Locally Ordained Minister’ (who is John Pretty, who as previously stated, is now intending to move towards Lichfield for family reasons). 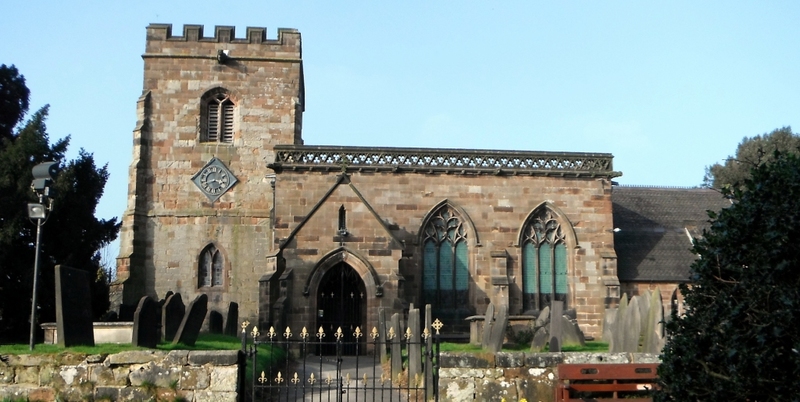 # St Margaret’s Church itself is Grade 1 listed, meaning it is of important national significance as an historic building. However, it gets no regular grant-aid. # Incidentally, Draycott Church Hall is now a ‘business’ independent of the church, and is run by volunteers. While it is not a drain on St Margaret’s resources, it is not able, yet at least, to be much of an income-generator for the church either. This entry was posted in heritage, religion and tagged St Margaret's Church Draycott. Bookmark the permalink. I used to live in Draycott, in the first semi-detached bungalow down Creswell lane; and next door used to be a family by the name of pointon. I also have my grandfather buried in st Margarets church: Joseph Downs, think died 1955. Also I was a choir boy in the church when rev chadwick was the parson there. Used to be a nice place Draycott in those days, like everything else, progress comes along. I have just read the article on St Margaret’s and I wonder where the writer got his information from? If we are to attract a replacement clergy it would be much better to be positive and upbeat rather than talking ourselves down. St Margaret’s is a thriving Church with a strong and loyal congregation. There are many and varied activities. Today (9th December) we have had carol singing by the children of Forsbrook School together with our Christmas Tree Festival. Bill and Nola Wards’ Coffee Morning on the 11th, our Festival of Lessons & Carols is on December the 21st at 6.30, and midnight mass on yhe 24th at 11.30. The St Margaret’s summer fair was a great success this year and raised enough money for us to pay the parish share and money over for heating oil and charity donations. It is sad that John Pretty is moving on as in my humble opinion he is the best preacher I have heard in a long time, and he makes great cakes too – he will be hard to replace. It is a pity that David Bickersteth is retiring next year. More upbeat articles would be more advantageous than the downtrodden article above. Thanks for the comments. The information comes from church documents. The research is all correct, and was ‘passed’ by the church’s authorities. Yes, there is a need to be positive. But sometimes it is necessary to assess the full situation first though, surely? Other comments would be welcome. Thanks – a good article.